Published on 17 January 2014. Monocle‘s Monocolumn is always worth a read – it’s a daily delve into a world of ludicrous wealth that really does vary from the sublime to the utterly ludicrous. My recommended read this week is a particularly fine example of the former: Andrew Tuck’s argument against the trend for locally-sourced food. What’s wrong with a banana? Well judging by the menus of nearly every new fancy-pants restaurant these days, quite a lot. It’s a thoroughly enjoyable read. The photo at the top was posted on Flickr by Glory Foods, and is used here under it’s Creative Commons sharealike licence. 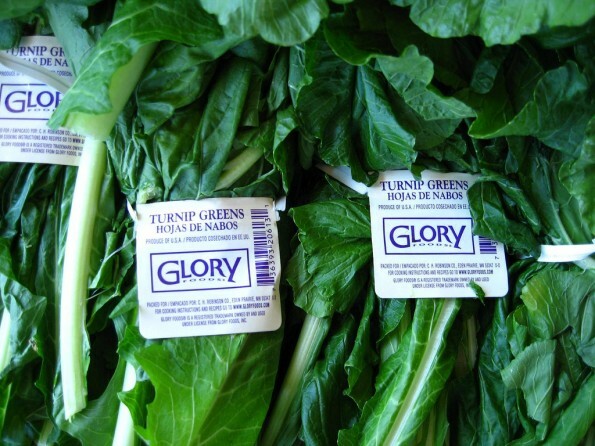 The irony that the ‘turnip greens’ in the picture are ‘produce of USA’ isn’t lost on me. This 2,118th post was filed under: Weekend Reads, Andrew Tuck, Monocle.